Open Monday-Saturday from 8 am to 11 pm Kaiser Maximilian Restaurant is located at Olas Altas #38B in the Zona Romántica of Puerto Vallarta. For reservations call (322) 223-0760 or visit KaiserMaximilian.com. Puerto Vallarta, Mexico - You've gotta love Mexico for how their people celebrate every possible holiday to the fullest. Every occasion is an excuse to eat, drink, decorate the town, and dance; and Semana Santa (Mexico's Easter holidays) is the biggest fiesta of them all! In the United States and Canada we just celebrate Easter, and perhaps go to church on Good Friday. In Mexico, the festivities are two weeks long! 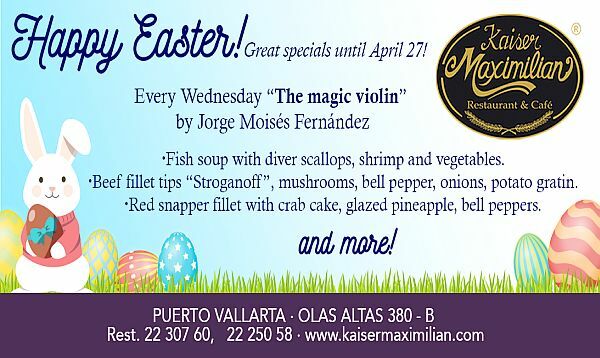 So, if you're spending the Semana Santa holidays in Puerto Vallarta and are hunting for great deals on fabulous meals, then hop over to Kaiser Maximilian for some tempting Easter specials. Through April 27, you'll enjoy special prices on everything from seafood specialties to exceptional Austrian fare. These Easter specials are being served, along with the regular menu, from noon to 11 pm at Espresso Bar and from 6 to 11 pm in The Main Dining Room. Both restaurants have covered outdoor seating and interior seating with air-conditioning. Whether dining al fresco at the European-style sidewalk café tables, or in the intimate air-conditioned dining room, you'll enjoy the fabulous cuisine, professional service and elegant atmosphere that have made Kaiser Maximilian one of PV's favorite restaurants.